Last Sunday a Dalit research scholar at the University of Hyderabad succumbed to dengue, as his friends and students in general raised alarm over the negligence shown towards his health condition by the University Health Center, who referred him to a crony private nursing home, despite it being on the black-list of the University for a year because of alleged fraud in the name of health service. 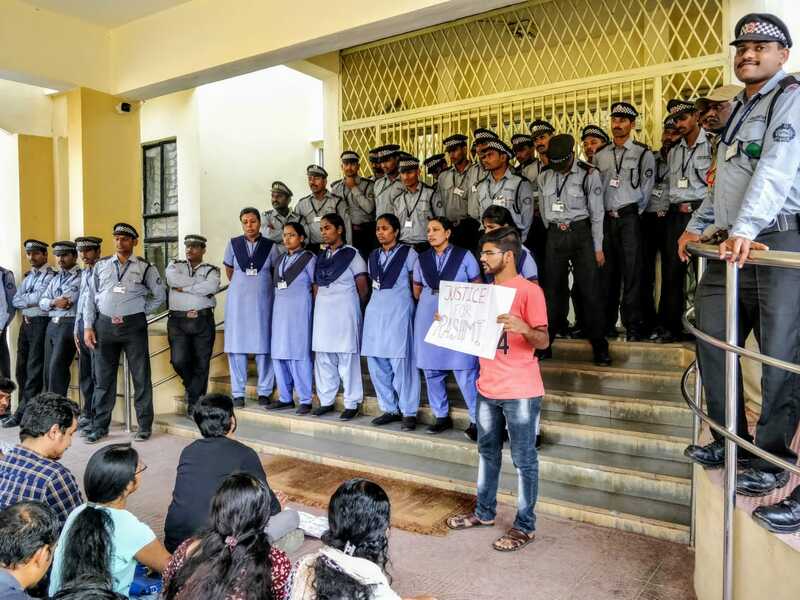 UoH students have been blockading the University administration building for the past couple of days, demanding a fair enquiry into the death and the negligence of the university that allegedly led to it, proper compensation for the victim’s family, and legal action against the Himagiri Hospitals. A GroundXero report. Two days back Rashmi Ranjan Suna, a student at the University of Hyderabad died from Dengue. Rashmi Ranjan was a PhD student at the School of Physics. The doctors of the Citizens Hospital, where Rashmi died, informed that he died due to multiple organs failure. Reportedly, Rashmi went to the University’s Health Centre with high fever last Monday around 1 am, for medical check-up. The doctors and staff of the University Health Centre, already notorious for its apathy towards the health of the students, gave him some tablets and asked him to take rest. As his body pains persisted, one of the doctors on duty referred to him to the Himagiri Hospital, a private hospital nearby. Himagiri Hospitals had once already come under fire from the students of UoH because of its exorbitant billings, and poor treatment facilities. Bowing to pressures, the University had to officially “blacklist” the private hospital few years back and terminate the agreement. But recently the University Health Center has begun referring patients to Himagiri again. Some have alleged monetary interests of the University administration in re-establishing ties with the hospital. The University has maintained silence on the question of what process was followed to renew the agreement. When one of his friends asked the Health Center doctor to refer Rashmi to the Citizens hospital, another private hospital nearby that has a somewhat better track record, although equally expensive if not more, than Himagiri, the doctor reportedly said “It is just a viral fever. It can be taken care of at Himagiri Hospital only”. At Himagiri, Rashmi was admitted into the general ward and put on saline drip. When he complained of continuing body pains, they shifted him into what they call as “ICU” rooms. Those who have been admitted to Himagiri before have alleged that there are no basic facilities in the hospital and what they call as ICU is nothing but a hall divided into six rooms separated by cloth curtains. Bowing to pressures, the University had to officially “blacklist” the private hospital few years back and terminate the agreement. But recently the University Health Center has begun referring patients to Himagiri again. Some have alleged monetary interests of the University administration in re-establishing ties with the hospital. Even after two days at Himagiri, Rashmi’s health progressively deteriorated. The Hospital conducted some blood-tests and reported him as “dengue-free”. It was also alleged that during these two days, neither the doctors from the University health center nor the staff, checked in about Rashmi’s health at Himagiri. On Thursday afternoon, when his condition became extremely serious, Rashmi’s friends and relatives decided to shift him to Citizens Hospital. Himagiri allegedly asked Rashmi to pay around Rs. 34 thousand before leaving for another hospital, which he had to pay from his pocket despite having the University health insurance cover since it would take nearly a week’s time to claim the amount. On Thursday evening Rashmi was taken to the Citizens Hospital in Hyderabad. Here, after a couple of tests, it was found for the first time in 3 days, that he was affected with dengue and by now the criticality level was so severe that they put him under 48-hours constant observation. The doctors also pointed out discrepancies in the test reports conducted by Himagiri. On Friday morning around 9 am, the doctors informed his friends that multiple organs in Rashmi’s body were damaged and there were signs of internal bleeding too. From then onwards, he was put on an external life- support that reportedly cost around Rs. 1 lakh per day. By Saturday, the Citizens bills had reached a whopping Rs.1.5 lakh, and they forced the patient to pay Rs. 90 thousand upfront. On Sunday, November 25th, Rashmi passed away at around 7 in the morning. Yesterday, after the University administration allegedly “rejected” the representations from the Students’ Union and a committee of students from the School of Physics, the general student population of UoH gave a call for a protest agitation, demanding “unconditional compensation, fair enquiry and immediate legal action”. Rashmi Ranjan Suna hailed from Western Odisha, from a marginalised community. He was reportedly the first one to graduate from his village and was in the 4th year of his PhD programme. His friends and teachers have claimed that Rashmi was a promising and sincere scholar. 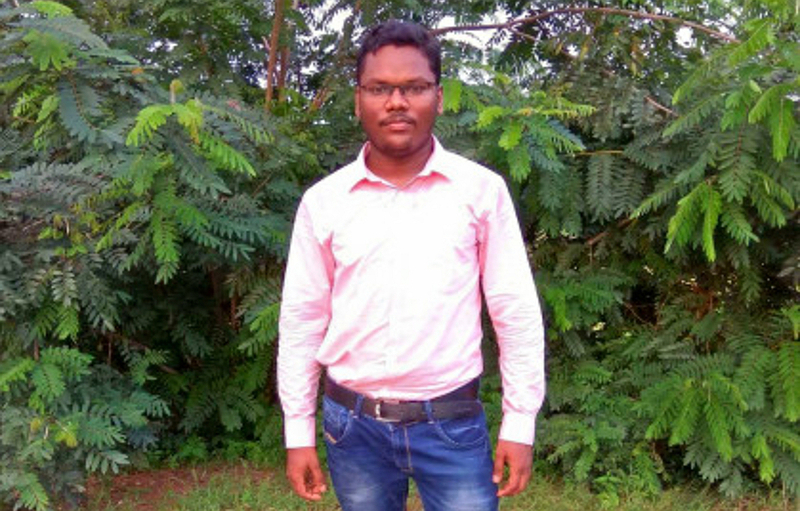 He had co-authored two papers in reputed Physics journals. He was also selected for an International Conference to be held in San Francisco, USA, in 2019. His death is an irreparable loss to his family, community, village and academics itself. He would have been an inspiration for every other young student from his native place. Students from the University broke out into protests since yesterday, demanding answers to several questions regarding the way Rashmi was treated (or rather not treated), and the general question about the situation of medical facilities in campus, and policies regarding medical insurance. One particular question that has been raised is about the so-called University “Medical Fund”, that is constituted by collecting Rs. 1500 per student at the beginning of the semester. The student strength of UoH is around 5000, amounting to a total collection Rs 75 lakh in the name of medical insurance. Students are now asking how this fund is managed, and why is this fund not used in such cases for critically sick students who can not bear such exorbitant medical expenses. Questions are also being raised about the cap of Rs 75 thousand that the University puts on insurance claims by any student. The agitating students have claimed that the University has never in history publicly revealed the accounts of the Health Fund. Yesterday, after the University administration allegedly “rejected” the representations from the Students’ Union and a committee of students from the School of Physics, the general student population of UoH gave a call for a protest agitation, demanding “unconditional compensation, fair enquiry and immediate legal action”. The administration, after repeated internal meetings through the day, proposed to set-up an “Enquiry Committee” to look into the matter, and the question of medical facilities in campus, within two weeks. This proposal was however rejected by the students since the two main demands of compensation for the student’s family and legal action against Himagiri were ignored by the University. “Such promises are primarily to bury the larger structural questions regarding the Health Fund, insurance policies, and tie-ups with crony private nursing homes,” one student told GroundXero. After the students continued with their agitation, the administration finally agreed to file an FIR against Himagiri, but as per latest updates University just filed a complaint with the police and refused to file an FIR. Moreover, the University has continued to deny any compensation for the deceased student. Meanwhile, students and teachers of the University have been raising contributions to pay off Rashmi’s medical bills. Some students however also alleged that in the name of helping the family financially, certain sections of students and faculty members are trying to maintain silence on the larger issues of inadequate medical support for students and alleged corruption with the Health Fund, by signing up as negotiators between the agitating students and the University administration. The Students Union has also been criticised by a section of the agitating students. “Representatives from student’s union agreed to all the terms of reference set by the admin. When faced with opposition from the student community, there seemed to be a visible indecisiveness on their part which was a major setback to the agitation”, alleged one of the protestors. Incidentally, the current Students Union of UoH is led by ABVP – RSS’s student wing – which was the organisation that was protected by the University Vice-Chancellor Apparao Podile after the death of dalit scholar Rohith Vemula 2 years back. 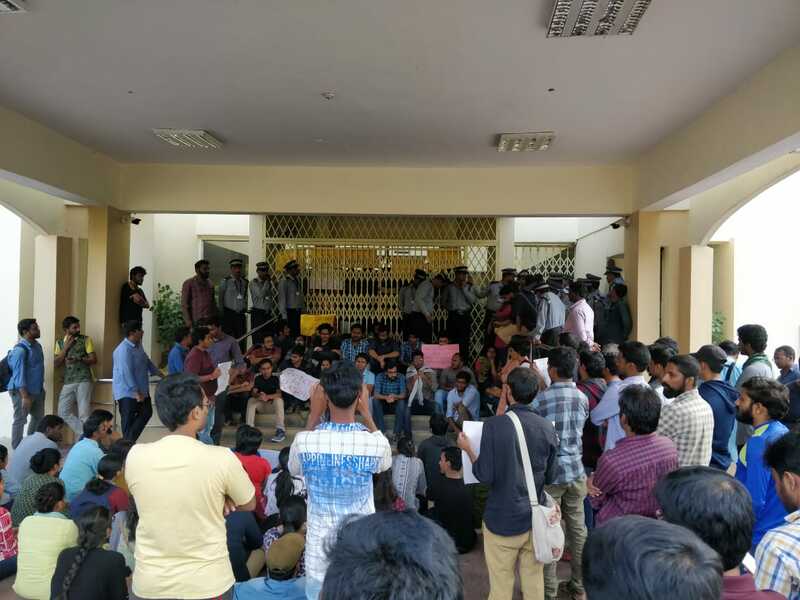 As the agitation continued late into the evening yesterday, the Registrar and the Dean of Students’ Welfare allegedly escaped from the administration building gheraoed by the students, with the help of the campus security personnel and Telangana police. Some of the agitating students chased the officials till little outside of the main gate, when they were attacked by the Telangana Police, and 6 of them were picked up. They were released later in the night. The student agitation continued today as well. The students gheraoed the administration building gate, but the University officials stayed indoors. The ProVC allegedly threatened students with slapping cases if the dharna was not lifted. The administration did however reveal under pressure that the ban on Himagiri Hospitals was lifted in November 2017 and the agreement renewed, but still refused to divulge what official process was pursued in doing all of this. “It is high time that the student community in general and the student’s union, in particular, must raise their voice to question the University’s negligence in Rashmi’s case and their illegal role in looting the students’ medical fund. This is our failure in securing a robust health care system for ourselves. It is evident from his death once again”, wrote one of the students.